Brenden, a 12-year old boy in New Washington, Ohio, has received a very special delivery today of his very own SDWR Autism Service Dog. NEW WASHINGTON, OH, UNITED STATES, April 4, 2019 /EINPresswire.com/ -- Brenden, a 12-year old boy living in New Washington, Ohio, has received a very special delivery today of his very own Autism Service Dog from Service Dogs by Warren Retrievers to assist him and help better communicate his needs. Based in Madison, Virginia, Service Dogs by Warren Retrievers, or “SDWR,” has a mission to provide specially-bred and trained dogs for people with invisible disabilities like Diabetes, PTSD, Seizure Disorders, or in the case of Brenden - Autism Spectrum Disorder. 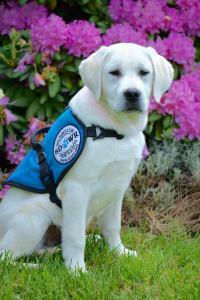 SDWR has hundreds of service dogs working across the United States and around the globe. SDWR is currently serving approximately 1,000 families. 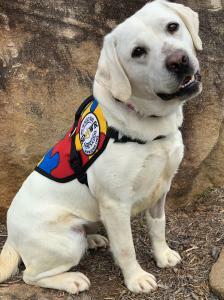 Jewell, a labrador retriever Autism Service Dog, recently graduated from SDWR’s Service Dog Raiser Program where volunteers diligently raise young service dogs in training over the course of approximately one year. Both the dogs and raisers must complete the foundation and skill set training provided through SDWR trainers at their facility in Virginia. Jewell will assist in reducing the effects each diagnosis has on the family’s independence and daily life by working continuously with Brenden. Since Jewell is a service dog and covered under laws in accordance with the Americans with Disabilities Act, he will be able to accompany Brenden and his family everywhere - from school, to the grocery store, and even to church on Sundays.